Each year, FPI gathers a bipartisan group of Members of Congress, their staff and other members from our community to experience the convergence of historical places and the group's shared values. This pilgrimage was the first of its kind, exploring the confluence of two significant freedom movements and their leaders: the abolition movement and women’s suffrage. From Auburn to Rochester, we explored how the movements converged and diverged, and the lessons that are embodied in the lives of leaders like Frederick Douglass, Susan B. Anthony and Harriet Tubman, the important decisions they made, the relationships they forged, and how they worked through differences. Since 1998, Rep. John Lewis (D-GA) has led close to 300 members of the U.S. House and Senate, as well as Presidents Barack Obama and George W. Bush, through Alabama on this nearly annual pilgrimage. In Montgomery, Birmingham and Selma, we have explored the events that dramatically challenged racial discrimination and turned the course of American democracy. Political leaders have universally described the pilgrimage as a transformative moment. 2017 marked 75 years since President Franklin D. Roosevelt signed Executive Order 9066, authorizing the removal of over 110,000 Japanese Americans from the West Coast based on ancestry-- over 60 percent were United States citizens-- and sanctioning their imprisonment in concentration camps. Our pilgrims explored these stories and events and their present-day implications. From San Jose to Angel Island, we learned the impact that past decisions continue to have over modern American law and politics. 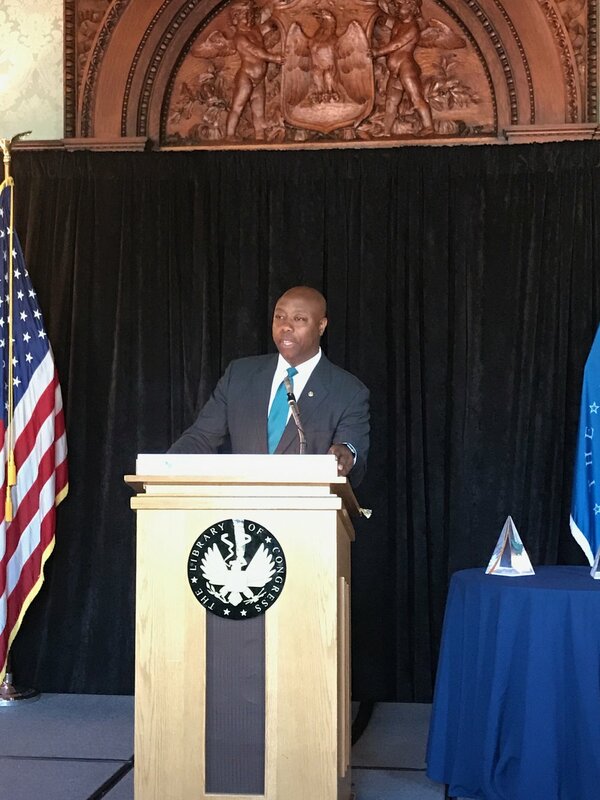 Named in honor of Congressman John Lewis and Congressman Amo Houghton, former co-chairs of The Faith & Politics Institute, this prestigious award recognizes leaders who have exhibited qualities of conscience, courage and compassion in their roles as public servants. Honorees are recognized for demonstrated integrity between their spiritual values and actions, and for their long-term commitment to leadership in service of the common good – regardless of short-term political ramifications. Named for the patron saint of the laborer, this annual breakfast and awards presentation was founded to raise awareness of the spiritual and moral issues that affect economic life in America. The weekly reflection groups organized by The Faith & Politics Institute allow members of Congress time and space for introspection and reflective dialogue. Other reflection groups, for senior congressional staff, are designed to help them meet needs unique to their role.